Once upon a time, I believed that good old fashioned running was the holy grail of cardio exercise. Really, what better total body workout existed other than sprinting or taking a nice long jog? I subscribed to this belief until my joints stopped liking the idea of running as much as I did, and after long nights of icing my knees, decided to look for a low-impact alternative. After testing the traditional stationary bike and elliptical machine, I met my true low-impact love: the vertical climber. If you are like me, then you probably have seen this sleek, seemingly innocent piece of equipment, tucked away into a lonely corner while patrons opt for the machines with television screens. The vertical climber machine does what it says: it makes you climb, as rock climbers do. You use both your arms and legs to mimic the motion of scaling a mountain, and after five minutes, you feel like you’re on the way to Mount Everest. It’s intense! But that’s a good thing, right? The vertical climber does not require the ankles, hips, or knees to brace or absorb impact, and it actually helps keep those major joints in alignment based on the climbing motion the user performs. It is also safe for the shoulder joints, as the required climbing motion the arms perform makes it difficult to rotate the shoulder too far backward. The push-pull motions will actually improve short-term mobility, and that will eventually lead to a greater range of motion. When you combine aerobic exercise with muscle building, as the vertical climber allows, the result is a calorie-burning fiesta. Because this is a total body workout that uses your own body’s resistance, you work much harder than you would on a treadmill, for example, where there is little resistance and the belt is doing much of the work for you. Your heart rate jumps to its max zone quickly on the vertical climber, and that’s how you know you are getting the best calorie burn. It’s obvious from looking at the vertical climber that both the upper body and lower body are hard at work, but you may be surprised to know how much the core is working, too. The climbing motion requires focused core stability, and your midsection will be hard at work to assist the extremities in pushing and pulling. But what’s most interesting is how the upper body has to try to match the power of the lower body, which is typically dominant because, well, we have two legs and walk. So as the legs push, the arms, back, and shoulders do their best to keep up, resulting in a newly sculpted upper-body. Interestingly, because of these required reciprocal motions, the vertical climber also activates the neurological system in a different way. This makes for a mental challenge on top of your body getting a beastly workout. Alas, a piece of equipment that does not require forfeiture of your entire living room. The vertical climber is sleek, simple, and space-saving. Its (genius) minimalist design means that you can literally put it away in a closet when you are not using it, as opposed to bulky equipment that burns more calories moving it than using it (here’s looking at you, treadmill). The vertical climber is also relatively quiet during use, so it’s even more perfect for those of you who have roommates, sleeping babies, or otherwise shared living quarters. Finally, it does not take much time to get a good workout using the climber. If you dedicate 20 minutes at least three times each week to stepping, then you’ll see quick results. Bonus: climbers usually come pre-assembled, so you don’t have to dedicate an afternoon to looking for lost screws. So, I’m sure you are ready to get a vertical climber to call your own, but there are a few factors you need to research before you purchase. As with any fitness equipment, the spectrum of a few hundred dollars to a few thousand dollars exists with vertical climbers. Regardless of your budget, you will want to look at the following features to ensure you have a quality piece of equipment that can help you reach your greatest heights (pun intended). The display is important both for how the machine looks as well as what kind of tracking system comes with it. This is especially crucial to consider if you indeed want a climber for your home gym; check into its dimensions and whether or not it folds for easier storage. Also make sure you see what kind of gadget is included to track your time and results; because of the compact design, some climbers have systems that are hard to see, which may or may not be to your preference. Some of these trackers also only track minimal information, such as time on the climber. If you’re into seeing calories burned or speed - which, no doubt, is motivating - you may want to fork over a little extra for an LED display. A good climber should include adjustable options for different heights and range of motion, but you may also be interested in a climber that includes different automated programs/workouts. This option fluctuates with price points, as some of the value climbers only offer basic climbing. If you are willing to pay more, you can find climbers that have up to thirty pre-programmed workouts. You can also shop around for climbers that offer resistance adjustability; most basic climbers only use your own body weight for resistance, but some higher-end models do have programmed resistance options. You definitely do not want to invest in a piece of equipment that falls apart after a short amount of time; be sure to look for steel or aluminum frames, as these are the sturdiest. Some machines also have rubber non-slip pads on the bottom, which are useful if you plan toyou’re your equipment on a hard surface. Your weight plays an important role in this as well, as budget climbers typically yield a weight limit of 200-250 pounds. If you’re heavier, then you may have to spend a bit more money to get a sturdier option that supports up to 350lbs. Warranty is to equipment as health insurance is to people; it’s not mandatory, but it’s really, really nice to have when something goes wrong. The standard warranty on climbers is one year for parts and labor, so make sure you do not settle for anything less than that. Some options have just two-month warranties, which is a bit on the short-side to get good use from the machine. What's the Best Vertical Climber? To give you a great starting point in finding a vertical climber to call your own, here are our vertical climber reviews of the best ones you can get your hands (and feet) on! 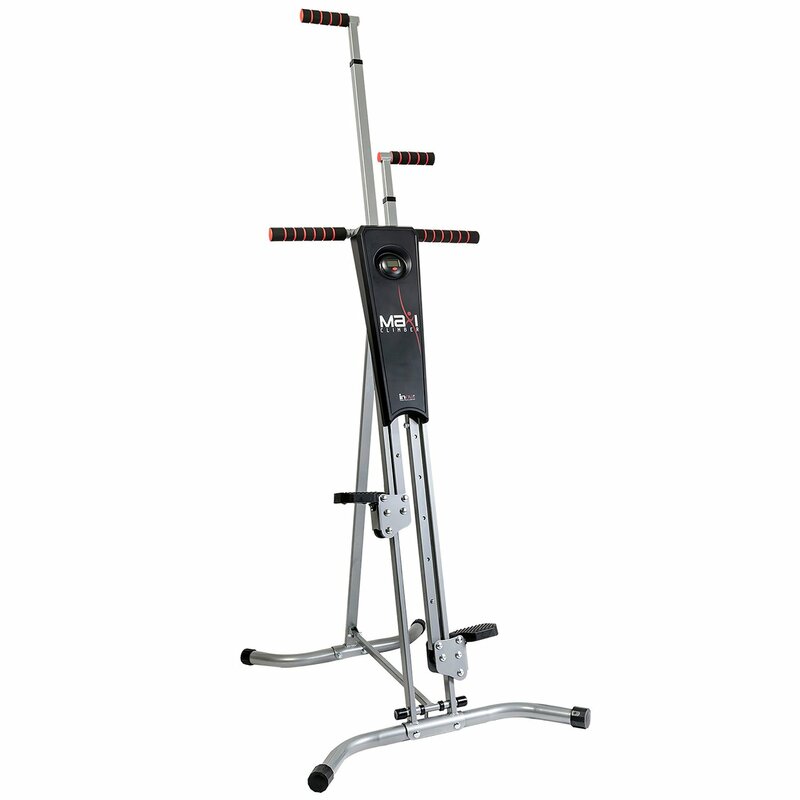 The MaxiClimber boasts an ergonomic design for all body types, and it is adjustable for various heights. It also comes 90% pre-assembled, so you have to spend about 15 minutes putting the finishing touches on it. It is durable with a cold-rolled steel frame, and the weight limit is 240 pounds. It definitely feels very sturdy on a hardwood surface and it's not bad even on carpet so you can feel free to get as rigorous as you want while watching TV in the living room. A small workout tracker comes with the Maxiclimber but it simply tracks your time on the machine and starts/stops as you do. It can be folded for easy storage, and it is extremely lightweight at around 30 pounds. Similar to the MaxiClimber, this is a steel-framed climber that offers adjustable options as well as four rubber non-slip pads to keep it extra stable. It also is foldable and only weighs in at about 40 pounds. The assembly is quick and easy (approximately 15 minutes), and it comes with the tool needed to put the finishing touches on it. The included electronic tracker measures both time and calories burned. This machine is cheaper than the Maxiclimber, but the price difference does not seem to compromise quality. 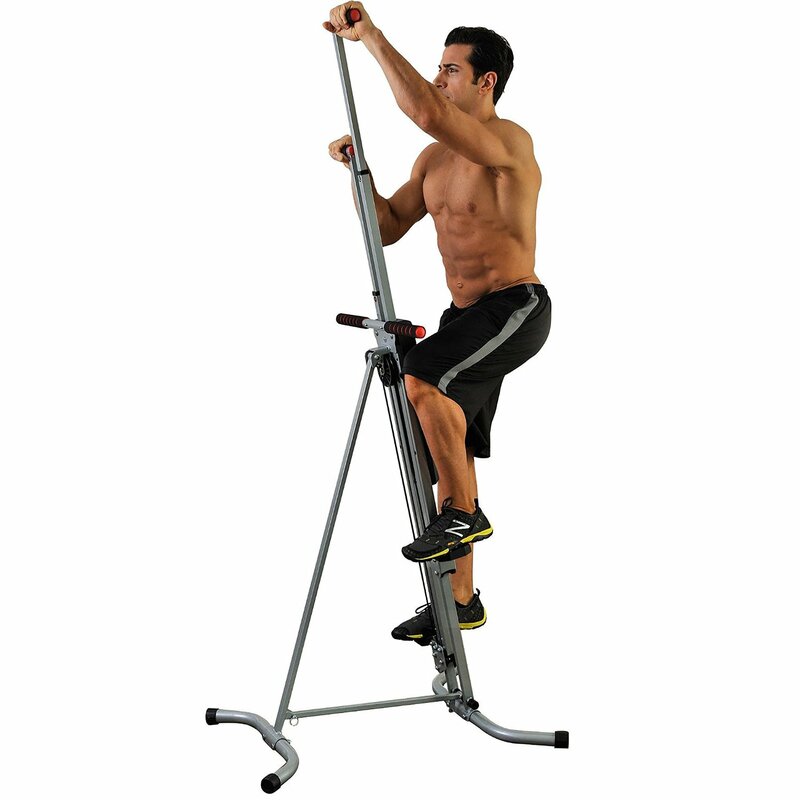 The Ancheer is definitely one of the more unique options; it is a 2-in-1 machine that features a small resistance bike along with the climber. The manufacturer recommends using the bike as a warm-up for the climbing. This machine is made from steel and has a higher weight capacity than the others reviewed, with the listed limit at 285 to 330 pounds. Its LED display is also much more thorough than competitors, as it provides the following information: scan, time, distance, speed, and calories. This machine can be folded away and is compact for easy storage. The climbing arms are adjustable, so it’s easy for all heights to use. This machine also comes with an impressive three-year warranty, which is longer than its competitors. Vertical climbers will increase in popularity as they become more well-known and recognized, and now you have the scoop before the trend. They definitely deserve attention because they pack a high-intensity workout without joint damage, and they are excellent additions to home gyms everywhere. Tell us about your experience using a vertical climber in the comments below!